Figure from paper cited later. If the top trace is correct that is a superb match between insolation (P) and proxy. A lot of reading follows. I’ll let skyfall speak and then then link the interesting part. Link to the paper from skyfall is to an author’s copy and is broken. I’ve dug out a proper copy. This dull looking open access paper hides gems. Celestial mechanical simulations from a purely classical point of view of the solar system, including our Moon and the Mars moons – Phobos and Deimos – are carried out for 2 millions of years before present. Within the classical approximation, the results are derived at a very high level of accuracy. Effects from general relativity for a number of variables are investigated and found to be small. For climatic studies of about 1 Myr, general relativity can safely be ignored. Three different and independent integration schemes are used in order to exclude numerical anomalies. The converged results from all methods are found to be in complete agreement. For verification, a number of properties such as spin axis precession, nutation, and orbit inclination for Earth and Mars have been calculated. Times and positions of equinoxes and solstices are continously monitored. As also observed earlier, the obliquity of the Earth is stabilized by the Moon. On the other hand, the obliquity of Mars shows dramatic variations. Climatic influences due to celestial variables for the Earth and Mars are studied. Instead of using mean insolation as in the usual applications of Milankovitch theory, the present approach focuses on the instantaneous solar radiation power (insolation) at each summer solstice. Solar radiation power is compared to the derivative of the icevolume and these quantities are found to be in excellent agreement. Orbital precessions for the inner planets are studied as well. In the case of Mercury, it is investigated in detail. This looks like surprisinly good correlation to me considering that this is not an “Apples to Apples” comparison. People who can make respectable “Backcasts” may be able to tell us when the next “Ice Age” will strike. The author has captured the problem in a single word! I’ve seen this before — quite interesting. It’s a timely reminder that model parsimony is a statistical & cultural paradigm. Nature has how ever many contributing cycles nature has. The p-values may tell us to admit no more terms to the model, but this can be wrong. Tim, say you were given a list of periods & amplitudes (~35-40) dictated by nature, with the only unknown being response phasing. Is your software easily configured to do the multidimensional phase optimizations to fit a series given such constraints? If so, I may have an exploratory puzzle to recommend. I also read the article in French and I was delighted to pick up the term “carbocentrism” (“carbocentrist”, “carbocentric”, “carbocentered”, etc.). The term is exactly right. I’d like to import the whole phrase, “chez les carbocentristes”, untranslated, as a new gallicism for skeptics. I’m not sure whether it was intended to be faintly disparaging in the French but it would be if dropped into an English sceptic piece. It reminds you that they are in an ivory tower without actually saying it. It is also possible to unlock as a last stage, allow fine time or period but only if the match is genuine otherwise a machines wakes up and says, huh, go away and will whizz off. If this happens some thought is needed on why. Aside I don’t think I have ever mentioned. Early on as part of testing I showed it a square wave to approximate. A square wave has a known particular decomposition. To my dismay if failed… nope, turns out there is a second solution which it found. Been a lot of unexpected results, related to how a figure of merit is computed, not something obvious in any published literature. Tim, I wish I had a few years of uninterrupted focus to work on software development. Actually, it might take more than a decade of uninterrupted focus to complete what I have in mind. You’re using some kind of forward and backward selection, right? And that is the optimization challenge — i.e. that the order of entry and removal of terms affects the ultimate choice of model? My understanding is that there’s a landscape of possible final models you explore, with the limiting factor being machine time — e.g. an exhaustive grid search is too inefficient (would take effectively forever), so you’ve settled on an algorithm that works well most of the time (and you guide it manually like any sensible, aware user would when it gets off into territory where it might not go if you had infinite time to program)? In the case I’m proposing, everything hinges on just 2 periods and an alternate mathematical representation of their event series that I’m exploring. So the model has only 2 parameters that inflexibly dictate an entire (large) family of model components (with fixed amplitudes & periods), as that’s how the earth & moon work in nature. I’ve never seen this method anywhere, but math is a big world and I’ve solved enough difficult problems to know that it’s almost always the case that someone else has already been there — more often tons upon tons of people have already been there, but sometimes just a few. A problem is not knowing what the methods are called in specialist communities and therefore not being able to search for them efficiently. A solution to this problem is independence. Most of the people by whom I was surrounded in grad school would just solve any problem they encountered independently. The focus was on being able to develop methods from scratch without any support. That was the paradigm. It’s inefficient, but it’s robust. I always prefer to develop my own algorithms from scratch, but lack of free time is a merciless killer that is forcing me to consider alternatives. I always find that with collaboration there’s the risk of fatal misunderstandings, but free time just isn’t on the horizon …and misunderstandings can be weathered …(or better yet avoided). A problem is that there are several simple models with very high r-squared. I need to do further exploration to develop objective criteria for selecting among them, as forecasts are sensitive despite tight fits over the record. I successfully developed a method (based on seasons & tides) for choosing which terms get priority for model entry, but logic dictated that all model terms should be included in hierarchically weighted fashion. This immediately led to a programming problem that I decisively don’t have time for. Hence the inquiry. It may also turn out that entirely new customized software is needed to finish solving the problem, but simpler possibilities have not yet been ruled out, so such a conclusion would be premature. I may e-mail you sometime in the weeks ahead if/when time permits the degree of attention & focus needed to evade risks of misunderstanding. We don’t usually discuss software on the Talkshop, nor do in detail on my own blog. Historically I have in specialist public places such as newsgroups where I was moderator, not that I said much. Computer based optimisers is a fascinating subject, as is optimisation in many other fields. Never as simple as it might seem, lots of constraints and unintended consequences. Conceptually a simple optimiser loop is little different from say Runge-Kutta as used in maths. Easy, now generalise and make large. A classic and infamous gotcha from computer science is the Travelling Salesman Problem. This explodes in time so fast it cannot be solved precisely (NP-hard). That leads to engineering style, do you want the answer or a good enough answer? “In Pursuit of the Traveling Salesman gives a very readable account of progress in tackling one of the most important problems in Applied Mathematics: the Travelling Salesman Problem. The problem of finding the shortest route through a number of cities is finite and therefore solvable in principle but becomes disproportionately complex as this number grows. Theoretical, practical and historical aspects of the problem are thoroughly explained. Is this French paper a rehash or repeat of the Gerard Roe paper ? I can’t get google to translate it in firefox. I note that the Roe paper didn’t reference the Edvardsson paper. There was a published comment that they [Edvardsson et al] got their calculations quite wrong for mars-phobos-deimos, and that the author agreed. Might that have led to the paper being ignored? No real discussion of Earth, but the topic is too far from comfortable ground for me. If you have trouble with the translation link the Talkshop has a link to both Bing and Google translators on the top menu. Try invoking it for yourself. You’ve unearthed a good point there. I’m in no position to appraise the matter either. A few bits and pieces on Milankovitch and glaciation that I have picked up. William McClenney, a geologist has been following the literature on glaciation quite closely for several years. His replies @ WUWT startingHERE to the Mosh Pup and Jai Mitchell are quite entertaining. …I assume you comprehend the problems here, Jai. Basically, it’s your classic Gordian Knot. Assume, for instance, the worst case for CO2. Then assume, for instance, that glacial inception should have already occurred if not for the early anthopogenic hypothesis (GHGs, land use etc.). You know from Sole, Turiel and Llebot (2007) that “The role of CO2 in the oscillation phenomena seems to be more related to extend the duration of the cooling phase than to trigger warming.” So think very carefully. Strip the heathen devil gas from the late Holocene atmosphere and take your glacial inception chances? Really? That is your recommendation? According to the early anthropogenic hypothesis we should already be in the next glacial were it not for AGW! You are recommending removing the only (so far) hypothesized glacial inception deterrent? Why Jai? Why would you even entertain removing such a possible climate security blanket for at least the next 4,000 years? That, Jai, is the single most important question ever to be asked of a member of the genus Homo……. The take home part of McClenney’s comments is since 2005, no one is supporting the extended Holocene thesis any more. This is the perspective. The summer solstice insulation minimum during MIS-11 at 65N was 489 Watt/m2 and it was 474 Watt/m2 in ~2005 (Lisiecki and Raymo, 2005). You need 15 Watt/m2 to get to the insolation minimum in MIS-11. I am not familiar with any CO2 estimates which correlate with a 15 Watt/m2 rise in atmospheric forcing. So the question becomes what else kicks the earth into glaciation? Ian Wilson and others have pointed out the north-south vector of the long term lunar influence. This seems to correspond with the ~1400 year Dansgaard-Oeschger oscillations, Bond events and Heinrich events that cause global temps to change up to 16C in dramatically short times. Another is the solar effects on the jet streams. Steven Goddard and others have noted that the polar vortex pattern over the USA this winter matches that of the Lauren-tide Ice Sheet. Last is the growth of sea ice in the Antarctic. If I were asked to pick a single point on earth that most likely has the greatest effect on global weather and climate, it would be 0 and 90W (Galapagos). This is where El-nino winds, the deep sea Cromwell current, the Panama current, and the Humboldt current meet. These flows are not constant and each has different cycles and those cycles are not constant. Cycles on cycles create extremes in weather and climate. These extremes have an effect globally. I suspect these cycles are also controlling our observed atmospheric concentration of CO2. CO2 is very likely a lagging indicator and not a cause of climate change. So does this mean more La Ninas or even a permanent La Nina condition? R. A. Cook looks at it from the point of view of energy. Given the actual latitude of Arctic and Antarctic Sea Ice, open water in the Arctic is a net energy LOSS while more sea ice in the Antarctic is also a net energy Loss. In other words the Climastrologists are watching the wrong place – SQUIRREL! The Antarctic sea ice extents ANOMALY in October 2013 was also very high – over 1.5 Mkm^2 of “excess” southern sea ice extents. ALL of this “excess” sea ice was between latitude 60 south and latitude 59 south. ALL of this “excess” southern sea ice extents covered an area LARGER than the entire area of Hudson Bay (also centered at latitude 60)…. And, as we can always predict, if today’s rates of Antarctic sea ice extents gain continue, the sea route around Cape Horn [Drake Passage] will be blocked to shipping within 8-10 years! ….Albedo of Arctic sea ice changes only based on day-of-year. Albedo starts high at 0.82, stays steady at 0.82 until May, decreases through the summer to a low of 0.46, then rises again to 0.82 until about September, then remains at 0.82 until the end of December. This is from Dr Curry’s measured data. 1. Albedo of sea ice does NOT change with latitude. 2. Albedo of open ocean changes with every HOUR of every day as the solar elevation angle changes each minute. Specifically, open ocean albedo does NOT change explicitly with latitude, but latitude affects the overall SEA change over day-of-year AND latitude and hour-of-day (HRA), These changes are based on the earth’s declination and geometry and is strictly and specifically defined. But, Hour-of-day and day-of-year CANNOT be separated from latitude. 3. Opposite the above, the yearly maximum solar radiation occurs in early January at 1410 watts.m^2. The minimum solar top-of-atmosphere radiation occurs July 3, when the Arctic sea ice is decreasing strongly day-by-day, BUT while Arctic sea ice is between min and max. Roughly, the edge of Arctic sea ice is between 74 and 76 north. At the point of maximum solar radiation at TOA, the ANTARCTIC sea ice is is a wide “ring” slowly varying from 59.2 south (last October under 1370 watts/m^2) to about 64 south latitude (in January under 1410 watts/m^2) to a minimum sea ice extent at 3 Mkm^2 (in March at 70 south latitude back down to 1360 watts/m^2). So, when the TOA solar radiation is at its maximum, ARCTIC sea ice is dark. When the top-of-atmosphere radiation is at its max, Antarctic sea ice is not at its minimum. Net effect: As a whole, Antarctic sea ice is MUCH, MUCH closer to the equator every day of the year. Overall, increased heat losses from open ocean in the Arctic (when Arctic sea ice is at a minimum in late August-September) are much greater than increased heat absorbed into that open water. More sea ice loss in the Arctic => More heat loss from the planet and a net cooler planet. The opposite happens in the Antarctic: More sea ice around Antarctica means more heat reflected from the planet and a net cooler planet. latitude (at MAXIMUM extents at 14.0 Mkm^2) and 80 north (if 4.0 Mkm^2). In the future, this minimum could go even closer to the pole: if there were 1.0 Mkm^2, all the arctic sea ice is a little beanie cap from the pole to 85 north latitude. The Antarctic sea ice is INCREASING at all times of the year. The Antarctic sea ice cycles between a minimum of of 4.0 Mkm^2 at latitude 70 south, to a maximum of of 19.5 Mkm^2 at latitude 59.2 south. The Arctic sea ice only varies between 72 north and 82 north. That is the first of several posts by Mr. Cook and others where they have a ‘discussion’ with Willis E. Several good papers on the subject are cited. Or quit using CO2 as THE factor in the climate models. Actually just toss the models. In other words we flushed millions down the toilet on climate models that are KNOWN to be a pure waste of time. Dr. Brown of Duke who has been working with ‘Chaos’ for years. He mentions ‘Strange Attractors’ where the climate will stay stable around one ‘Strange Attractor’ for years and then enough factors change in the right direction to boot the climate into staying stable around a different ‘Strange Attractor.’ This is seen in the saw tooth pattern of temperature over the long term. Identifying the factors effecting climate and the cycles as you guys are trying to do is a much better use of time, money and effort. I have been looking at the Antarctic sea ice for a while and wondering what would happen if it joined South America. After reading Gail’s post it would seem I am not the only one, then Gail brings in strange attractors. If the ice closes the gap an entire new set of strange attractors will come into play. Frightening concept, but the gap is getting smaller, that big ice sheet that the AGW crowd tell us is breaking free could be a big enough plug to fill the hole. That would make for rather rapid climate change and not in a nice way. The information that the Arctic vortex followed the same pattern as the ice sheet in the last glacial is a wake up call. Anyone here on Rogers site know how to kick start the sun? Congrats on the UKIP thing Roger Europe and England need a wake up call. This is the most interesting reexamination of Milankovitch Cycles I have seen in a long time. I think the Antarctic is probably more critical to the climate that the Climastrologists want us to think. The closing of the Isthmus of Panama and the opening of Drake Passage changed the entire ocean circulation pattern and is thought to be what caused the current Ice Age. The Tinsley and Yu’s review paper has an explanation as to how an increase in ions in the atmosphere results in more extreme winter storms. The paper also has an explanation as to why there was the highest amount of cloud cover in the Arctic in the summer of 2012, which resulted in the greatest recovery in sea ice in recorded history. The GCR flux is responsible for almost all of the production of ionization below 15 km altitude, that determines the conductivity in that region. The MeV electrons and their associated X-rays produce ionization in the stratosphere, and affect the conductivity there. The current flow in the global electric circuit is generated mainly by charge separation in deep convective clouds in the tropics, and maintains the global ionosphere at a potential of about 250 kV. Variations above and below this value occur in the high latitude regions due to solar wind -magnetosphere – ionosphere coupling processes. The current density Jz varies horizontally due to variations in the local vertical column resistance (this is affected by the GCR and MeV electron fluxes) and by variations in the local ionospheric potential (especially to those in the high latitude regions). Because Jz flowing through clouds in the troposphere responds to conductivity and potential changes occurring all the way up to 120 km altitude, it is a very effective coupling agent for linking inputs in the stratosphere and ionosphere with cloud levels…..
Based on the GCR-CN-CCN-Cloud hypothesis and the influence of GCR ionization change on particle formation rate at different altitudes as shown in Figure 4.2, we can expect that if GCR variations have any impact on cloudiness, they should correlate positively with low cloud amount and negatively with high cloud amount. For middle clouds, such a correlation (if any) is likely to be weak. …In a winter cyclone the primary driver of the dynamics is the baroclinic instability in the winter circulation, with the storm extracting vorticity from the latitudinal shear in the circulation, and converting it to the vorticity of the cyclone. The effective diabatic heating associated with precipitation and reduced cooling of entrained air amounts to an increase in potential vorticity and uplift in the air mass, and is likely to concentrate the vorticity near the cyclone center. In addition, by enhancing the feedback processes inherent in the baroclinic instability, it can increase the overall vorticity of the cyclone. It has been demonstrated analytically by van Delden  and from numerical storm simulations by Zimmerman et al. and Mallet et al. (1999) that a positive feedback exists between the storm dynamical configuration and the diabatic processes. Thus precipitation changes explain the many reported examples of correlations of the vorticity area index (VAI) with GCR flux change and Jz reviewed by Tinsley . the 1960s by Walter Orr Roberts and associates. The Roberts and Wilcox effects are part of a more general influence of solar activity affecting Jz and clouds, which is part of an even more general influence of electroscavenging on clouds. The precipitation changes associated with cosmic ray and Jz changes have been evaluated by Kniveton and Todd (GRL 28, 1527-1530 and 3279). In winter storms the VAI response arises from a redistribution of vorticity within the storm because of diabatic heating changes. The storm vorticity changes have longer term dynamical and climatic consequences. Are stratospheric aerosols the missing link between tropospheric vorticity and Earth transits of the heliospheric current sheet? Journal of Geophysical Research, Volume 101, Issue D23, p. 29689-29700, 1996. Evidence has accumulated for the past two decades demonstrating a correlation between Earth transits of the heliospheric current sheet (HCS) and changes in winter tropospheric vorticity. These correlations persisted for a few years following the Agung and El Chichón volcanic eruptions, but were significantly weaker at other times. This suggests that the missing link in a physical mechanism explaining the correlation may involve volcanic aerosols and their effect on cloud microphysics, via atmospheric electricity. An analysis of 500-mbar northern hemispheric vorticity for the 1991-1994 winter periods following the Pinatubo eruption shows a similar correlation between tropospheric vorticity and Earth transits of the HCS, supporting the previous interpretation. This study I have very high regard for. The following goes hand and hand with the study I just sent in the previous email. These four factors either combined or in some combination are responsible for all the climate changes on earth. If one agrees with this then one will also have to agree that global climate change is synchronous. 1. The initial state of the global climate. a. how close or far away is the global climate to glacial conditions if in inter- glacial, or how close is the earth to inter- glacial conditions if in a glacial condition. b. climate was closer to the threshold level between glacial and inter- glacial 20,000 -10,000 years ago. This is why I think the climate was more unstable then. Example solar variability and all items would be able to pull the climate EASIER from one regime to another when the state of the climate was closer to the inter glacial/glacial dividing line, or threshold. 2. Solar variability and the associated primary and secondary effects. Lag times, degree of magnitude change and duration of those changes must be taken into account. I have come up with criteria . I will pass it along, why not in my next email. a. solar irradiance changes- linked to ocean heat content. b. cosmic ray changes- linked to clouds. c. volcanic activity- correlated to stratospheric warming changing which will impact the atmospheric circulation. d. UV light changes -correlated to ozone which then can be linked to atmospheric circulation changes. e. atmospheric changes – linked to ocean current changes including ENSO, and thermohaline circulation. f. atmospheric changes -linked also to albedo changes due to snow cover, cloud cover , and precipitation changes. g. thickness of thermosphere – which is linked to other levels of the atmosphere. 3. Strength of the magnetic field of the earth. This can enhance or moderate changes associated with solar variability. a. weaker magnetic field can enhance cosmic rays and also cause them to be concentrated in lower latitudes where there is more moisture to work with to be more effective in cloud formation if magnetic poles wander south due to magnetic excursions in a weakening magnetic field overall. 4. Milankovitch Cycles. Where the earth is at in relation to these cycles as far as how elliptic or not the orbit is, the tilt of the axis and precession. a. less elliptic, less tilt, earth furthest from sun during N.H. summer — favor cooling. I feel what I have outlined for the most part is not being taken as a serious possible solution as to why the climate changes. Rather climate change is often trying to be tied with terrestrial changes and worse yet only ONE ITEM , such as CO2 or ENSO which is absurdity. Over time not one of these one item explanations stand up, they can not explain all of the various climatic changes to all the different degrees of magnitude and duration of time each one different from the previous one. Each one UNIQUE. Examples would be the sudden start/end of the Oldest, Older and Younger Dryas dramatic climate shifts, the 8200 year ago cold period, and even the sudden start of the Little Ice Age following the Medieval Warm Period. Gail, the answer to your question is what I posted in the above, which is the Beginning State Of The Climate, Solar Variability(duration /degree of magnitude change)Strength of the Earth’s Magnetic Field, along with Milankovitch Cycles. Those four factors can /will kick the earth into a different climate regime due to primary and secondary effects. Thresholds can be achieved so when it happens it could be quick although the lead up to the happening can be slow and gradual. The ap index has been extremely low post 2005 and it looks like no recovery is in site. If you look at the study I sent between temperature versus the aa index you will see the correlation is quite strong. If you match CO2 concentrations versus those temperature changes you will see NO correlation at all. I listed the secondary effects in my previous post by the way. All the commentary on this web-site shows WE(on this web-site in aggregate) are on the correct path when it comes to why/how the climate will change going forward. If climate science looked at all the likely factors and tried to ‘weight’ them, it would have a much better chance of making progress IMO. The current ‘tunnel vision’ is holding everything up. So true old brew and sites like WUWT keep it going since they block any real debate. I gave Anthony a piece of my mind today. Of course it will never be posted. He will never allow posters like myself to challenge his precious Leif/Willis. I am for all out give and take when it comes to climate discussion with a level playing field. You don’t pick and choose what someone may or may not say when it is it is grounded in scientific opinion. point. I certainly agree. Although I do not put the list of factors in the same way Salvatore does. 3. What other factors are effecting the sun. Is it at a grand solar minimum or maximum? 4. The above will effect the ozone and albedo and other factors and can change the actual amount of energy received by the earth from the sun as well as the weather patterns such as the positions of the polar vortices and jet streams. 5. Lunar influences, specifically the north/south vector Ian Wilson and others have identified. 6. Volcanic action. This seems to be connected to grand solar minimums and perhaps lunar? The data is certainly out there and if a casual dabbler like me can see it you know it is also known to the Climastrologers but it doesn’t fit well with their ‘Cause’ so they ignore it. Gail, you are no casual dabbler. Your knowledge is extensive. OH, and Salvatore thanks for the link to that paper. Dr. Joan Feynman papers are always good reading. You probably saw this some time ago when it was first shown at WUWT, but the inflection point during the same time period of the Super El Nino of 1997/98 I find intriguing. We correlate an overlapping period of earthshine measurements of Earth’s reflectance (from 1999 through mid-2001) with satellite observations of global cloud properties to construct from the latter a proxy measure of Earth’s global shortwave reflectance. This proxy shows a steady decrease in Earth’s reflectance from 1984 to 2000, with a strong climatologically significant drop after 1995. From 2001 to 2003, only earthshine data are available, and they indicate a complete reversal of the decline. Understanding how the causes of these decadal changes are apportioned between natural variability, direct forcing, and feedbacks is fundamental to confidently assessing and predicting climate change. From a draft of the paper: Inter-annual variations in Earth’s reflectance 1999-2007. 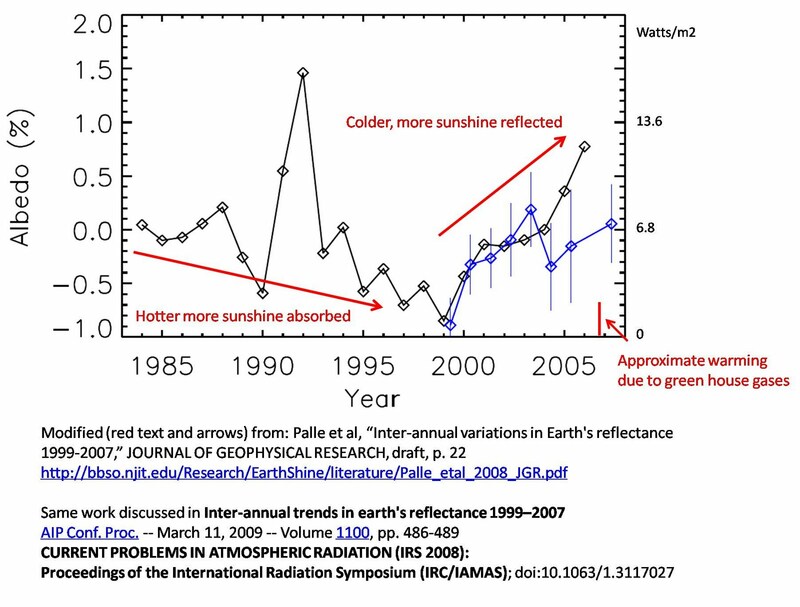 The overall reflectance of sunlight from Earth is a fundamental parameter for climate studies. Recently, measurements of earthshine were used to find large decadal variability in Earth’s reflectance of sunlight. 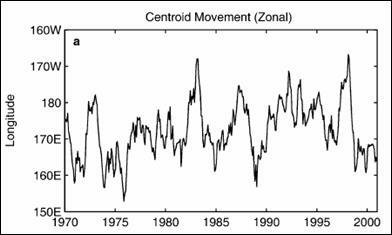 However, the results did not seem consistent with contemporaneous independent albedo measurements from the low Earth orbit satellite, CERES, which showed a weak, opposing trend. Now, more data for both are available, all sets have been either re-analyzed (earthshine) or re-calibrated (CERES), and present consistent results. Albedo data are also available from the recently released ISCCP FD product. Earthshine and FD analyses show contemporaneous and climatologically significant increases in the Earth’s reflectance from the out-set of our earthshine measurements beginning in late 1998 roughly until mid-2000. After that and to-date, all three show a roughly constant terrestrial albedo, except for the FD data in the most recent years. Using satellite cloud data and Earth reflectance models, we also show that the decadal scale changes in Earth’s reflectance measured by earthshine are reliable, and caused by changes in the properties of clouds rather than any spurious signal, such as changes in the Sun-Earth-Moon geometry…. If the same pattern has continued, increasing or level cloud cover, I doubt we will get much of an El Niño this year if we get one at all but I think we are looking at La Nada. There is just not enough energy going into the oceans. For what it is worth Gallopingcamel has two excellent additions to the science. Both are incredible nuggets that should not be lost. I hope they won’t be Gail, I know about it and GC has input. I’m the one being slow, no mental energy left from firefighting legal stuff to do with badly behaved outsiders. I am very, resist words, upset. I am more than impressed with your comments on Milankovitch cycles even though the mathematics is way above my pay grade. I was hoping to meet you in Fayettevile on my way to Raleigh on Thursday, May 29 or on my way home to Florida on the following weekend. It is always a pleasure to visit North Carolina. Robert Brown is traveling next week but I plan to spend some time at Starbucks with Nicola Scafetta. To me this is the deciding “base” parameter on which all other climate effects work. Since the last warming of the deep oceans (up to ~290K) that ended ~84 mya they have been cooling down some 18K. When the deep ocean temperature dropped below ~280K icesheets began to form an Antarctica. Below ~275K seems to be the deep ocean temperature that enables the Milankovitch cycles to maintain the current cycle of glacials / interglacials. In the comments I introduced the term DOSCA: Deep Ocean Surface Cooling Area expressed as a percentage of total ocean surface area. To me this works as an “amplifier” for the effects of ao Milankovitch and solar cycles. Gail, the info. you have posted from Albedo, to Antarctic Sea Ice role in the climate to Atmospheric Dynamical Responses to Solar Wind Variations is where climate science should be focused , in contrast to all this nonsense about global man made warming due to CO2. In the above post notice the lack of significant volcanic activity post 1900. Further evidence that volcanic activity is inversely related to solar activity . Temp increase as volcanic activity decreases. Over reporting, ie. data inconsistency? Temporal phase reversals (in deceptive appearance only) can be spatial. To me this is the deciding “base” parameter on which all other climate effects work…..
One of the points that seems to be missed is the large heat capacity of the ocean and its ability to store small increments of energy over long periods. This graph gives the different depths that various wavelengths of solar energy penetrate the ocean. Warmists like L.S. keep saying the TSI only changes 0.1% or whatever and completely ignore the fact that the wavelength ratio changes and therefore the depth to which the solar energy penetrates changes. This alone could manifest as increases or decreases in ocean heat storage/discharge (ENSO) and also cloud cover. If the Wavelength Ratio shifts towards the IR then more energy is “deposited’ closer to the surface and ultimately causes more evaporation ===> cloud cover. Small changes integrated over large areas and long periods of time can have major effects. I think of it as pushing a child on a swing. Very little effort is needed to keep the swing in motion once it is in motion however small changes in that amount of push will accumulate and the swing will either go higher or slow down or even stop. …Our oceans are heated at depth by intermittent diurnal pulses of of SW radiation peaking at over 1000 w/m2. Because of the slow speed of non-radiative energy transport back to the surface, this has a cumulative effect on temperature that cannot be calculated by SB equations…. So yes, what you said makes sense though I never thought about it before. So thanks for pointing it out. One of the other changes of course was the rearrangement of the continents that changed the ocean circulation. RACookPE1978 @ WUWT had several good comments as to why a loss of Arctic sea ice = loss of energy to space via open water because it is closer to the poles while an increase in Antarctic sea ice also = a loss of energy via albedo because the Antarctic sea ice is closer to the equator. So the present configuration of losing Arctic sea ice and gaining Antarctic sea ice do not cancel each other but are an additive effect of losing more energy. He mentions Judith Curry’s work (actual measurements) in this one. In this comment he was kind enough to “… duplicate below a “spreadsheet copy” of a spreadsheet I have for all latitudes for the actual radiation on to a horizontal surface at 12:00 on that “average” 342 watts/meter^2 day….” so it might be of interest. Add in the increasing albedo post the major El Nino of 1997-98 shown by the Earthshine Project paper and a weak sun, I really do not know how much longer the Climastrologists can keep up the Con game. All you have to do is look at Robert Felix, IceAgeNow website to see it is NOT hot elsewhere in most cases. Also for crop failure it is not the net ‘Global temperature’ that matters but the wild swings in weather like Polar Vortices and Blocking Highs caused by the meandering jet streams we have been seeing of late. I am hoping the USA can come up with the equivalent of UKIP and Farage before it is too late. Could you give me a clue as to what I should explain differently to get this idea over the floodlight? Yes, but no reason why the DEEP oceans warmed ~18K. Remember the Ocean Heat Content (OHC) discussion. The “alarming” temperature rise was some 0,06K (or 0,006K? )or something similar. I’m talking eighteen whole degrees. Let the oceans warm 3 to 5 degrees, and we’re out the glacials. Angiras: What about ample evidence of tidal action in paleo records over millions of years?? !